When 3L Phillips McWilliams and 2L John Wall learned about “Project Salute,” a service project aimed at helping military veterans with legal questions, they knew they had to bring it to South Carolina. Both served in the military and are active in the USC Law chapter of Service Members and Veterans in Law (SVL), a group that addresses the welfare of military personnel and veterans. But as students, McWilliams and Wall knew they couldn’t do it alone. So they reached out to Class of 2009 alumni Will Harter and Walt Cartin for help. As veterans themselves, Harter and Cartin jumped at the opportunity. Cartin convinced the Richland County Bar Association’s Young Lawyers Division to sponsor the program, while Harter took the lead in launching it and rounding up a team of volunteer lawyers — all of whom had served in the military and graduated from USC Law. 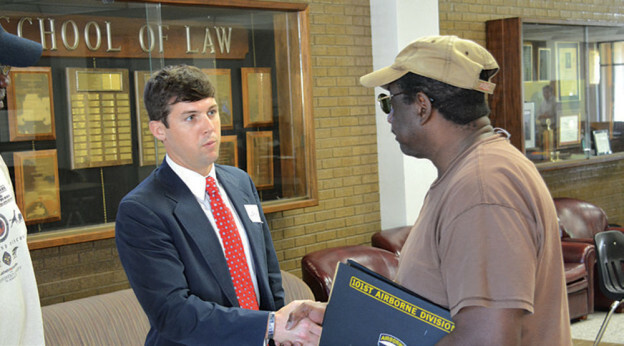 With the law school hosting and SVL members assisting, the first “Project Salute” was launched in August, helping S.C. veterans file or appeal their benefits claims. “It’s one of the best things I’ve done. Not only are we able to make a difference in the lives of these vets, but we’ve also created this valuable network with alumni who have similar interests and are so willing to help students out,” McWilliams said. This entry was posted in Fall 2013 on 15 October 2013 by Rob Schaller.